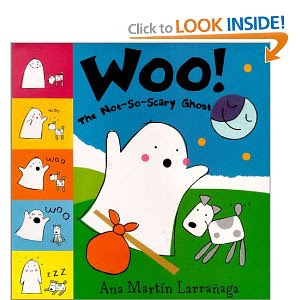 Preschool Playbook: "Woo, the Not-So-Scary Ghost"
Anyway, the Pre-K teacher had the cutest ghost out yesterday and it made me think of this story. I thought the ghost would be a great addition to the story. He is really easy to put together. The first thing to do is to fray the bottom(or top) of the paper bag. I thought the children could just cut slits, or you will see this ghost has a jagged cut bottom. Now take a black marker and draw a spooky face. Crumble some newspaper and stuff it into the bag. Put in a few staples so that the newspaper will stay in the bag when it upside down. Finally take two cut out arms and staple them to a crease in the side of the bag. I thought it would be neat to maybe feed a string in the top and hand the ghost. Happy Halloween.